Handgun marksmanship training will not only help you survive an attack, it will give you legal ammunition in a court case and confidence that may prevent the attack before it ever happens. Shifting emphasis from the legal to the practical, we need to ask just how good of a shot are you? If a loved one has been grabbed by an armed robber who decided to hit the store at the exact time you were at the check out stand, or if you are the last line of defense between a cowering group of church congregants facing an armed terrorist killing infidels, could you reasonably interdict the attacker? In attempting to interdict an attack, will you be cool, calm and collected, and purposely line up your sights and squeeze the shot to hit the brain or high torso? It is quite a feat of marksmanship while adrenalin is flowing. Are you up for that challenge? After all, isn’t the reason we carry guns in the first place to be able to stop criminals from killing? Practical shooting competitions give you the chance to practice skills under stress. In addition to local matches, each year I compete against a hundred or more other folks, many the cream of the crop in the tactical training world, in a three to four stage match at the RangeMaster Tactical Conference in Memphis, TN. There I am challenged to solve the problems laid out before me both efficiently and better than the other competitors. The more you do a high-stress activity in training, the less likely it is that you will be too adversely affected by the stress of the real thing. Matches like this force you to make decisions while under the effects of stress, just like you might face in a real-world incident. If your actions are called into question in a court case, you can speak from experience about how you had been trained to make split-second decisions, and how you practiced as often as you could. You can testify to undertaking the very same type of training and practice that courts have deemed necessary for law enforcement officers. That’s a big plus. The final aspect of training is confidence. You need to exude an aura of confidence; this will make you less likely to be attacked. As a rookie police officer, I was told that if you were well groomed, in a clean uniform and with your duty belt sorted out, you would be better respected and find criminals more likely to avoid a physical confrontation. I believe this to be absolutely true. But, how does this affect the average armed citizen? The same results enjoyed by the squared-away, professional-looking cop extend to armed citizens who carefully guard their appearance. If “competent armed citizen” was listed in the dictionary, would a picture of you make an apt illustration? What would that picture look like? It would show a person who looks respectable. You want your courtroom appearance to match your police mug shot: clean clothing and no cute t-shirts with funny sayings like “If you die, we split your gear.” Non-gunny clothing seems the best choice. There is more to this issue than just the clothing you wear or your grooming habits. It is also important that you do not look the part of a willing victim. We have all heard the reports of the little old lady being mugged, who turns the tables, draws her pistol and shoots the attacker. Why did the mugger choose the little old lady, not a former NFL linebacker? Of course, the answer is he thought the older woman was an easy mark and the linebacker a tough opponent. While few can resemble the linebacker, we can all work to not look like easy prey. If you are carrying a gun, you should be alert at all times, especially in public. If you are well trained and someone approaches you, just knowing you have options that unarmed individuals do not will help you remain composed and ready to counter violence. 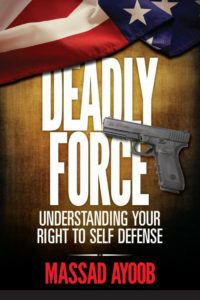 We cannot quantify the number of people who are not attacked because of being armed, but we can logically draw the connection between being armed, trained and confident with not having to use deadly force in self-defense to resolve or avoid attack. The power of prevention is likely the single most important reason to seek out competent and extensive training. And then once trained, continue to take classes to keep your skills sharp. After you’ve done everything you can do to prepare yourself there is one final thing you absolutely must do: Make sure your membership in the Armed Citizens’ Legal Defense Network is active. Even if you do everything right in self-defense, you can still be put through a legal nightmare. The Network exists for times like that—when you need help in a worst-case scenario. Click here to see the benefits and join. Click the following links to read Part I and Part II of this series.